When [the] Mother Ship Landed Part 2: Along Came "Cath"
When Motherhood was in London, I kept on bugging her about my pabili. Mainly Cath Kidston stuff. See, when Motherhood went to London almost exactly a year ago, she brought me a Cath Kidston bag as pasalubong. Honestly, I wasn’t THAT excited about Cath Kidston bags…I mean, they’re not LV or Balenciaga or Chanel or Chloe or any other bag that women expectedly salivate after. Heck, I even find Cath Kidston’s floral designs pangmatanda, as in matandang lola na (because my lola’s daster and umbrella were floral)! 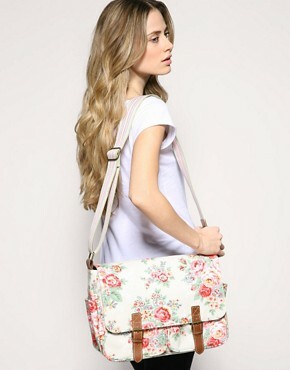 But the first time I carried my Cath Kidston Day Bag, I fell so hard in love. Inspecting it up and close and personal, you’d know this was far from the cheap “ecobag”-ish waterproof bags that are being sold aplenty. I also loved that it’s very sturdy and roomy. And fuss-free—pang-mommy talaga! Because when I carry a designer bag, I really freak out (as in tumitili ako nang matinis at nakakahiya) when it’s not properly handled: I am careful not to put it on the floor or for it not to get wet, and I’d even remove some of my stuff in the bag kasi baka mabanat nang sobra ang strap. Randy would always roll his eyes. Hehe. But not with Cath Kidston bags. 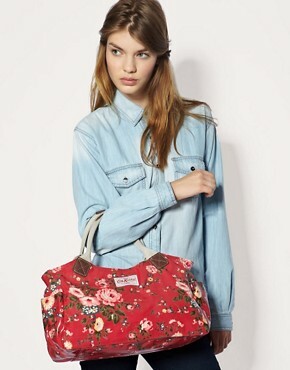 Cath Kidston bags allow me to be my carefree (and careless) self! And later, I realized that Cath Kidston designs were not that lola–ish at all. They’re perfect when you’re wearing something clean and crisp. O ‘di ba ang chic?!? Nothing lola–ish about it! Nasa pagdadala lang ‘yan! Anyway, to ensure I get the Cath Kidston bags I liked, I checked out its website first. Of course, I went to the SALE section and took it from there. I gave the photos to Motherhood (via email and Facebook message), and she did the rest. Do you want see what she got me?!? Oh please say, “Yes!! !” I’m too excited to show you my Cath Kidston loot! Dahil mapilit kayo, sige na nga ito na….jaraaaaaaaan!!! I got this in preparation for when I might have another baby (Lord let it be super pretty, super smart, and super bait healthy normal baby girl please!). It’s not a diaper bag per se, but it seems like one. It’s very roomy, it’s washable, and lightweight. Leather handles and smart coated cotton make this modern-vintage bag fancy enough to take to dinner, but not so posh you need to save it for best. Use it everyday and enjoy as the compliments roll in. It’s roomier than my bowling bag, although my bowling bag is prettier. Hmmm, pinag-iisipan ko pa whether I’ll get it…Whaddya think? By the way, I’m sure you been seeing plenty of Cath Kidston bags being sold, and are wondering whether they’re authentic or fake. Ladies, wait for my next post because I will let you know how to determine whether the Cath Kidston bag you’re carrying is fake or authentic. For the meantime, adiós! Aaaah I’m excited! I also asked my Mama, who’s in London now, to get me Cath Kidston bags. Sakto kasi na sale when she got there last July at magsesale nanaman before she leaves in October. I thought of the same thing, Dew. With Little Peanut on the way, a Cath bag could be perfect as a stylish, diaper/carry-all bag. Cheers to our muthers! Hi Kristel! I’d love to have Cath china! Where do you get your Cath Kidston stuff?